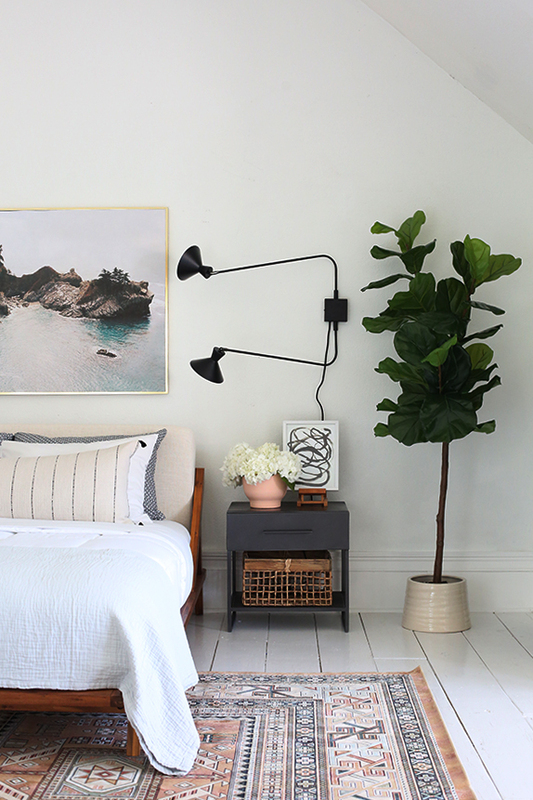 Last week in my insta stories, I showed you the behind the scenes of our guest bedroom makeover (you can still view those stories here in my highlights!). 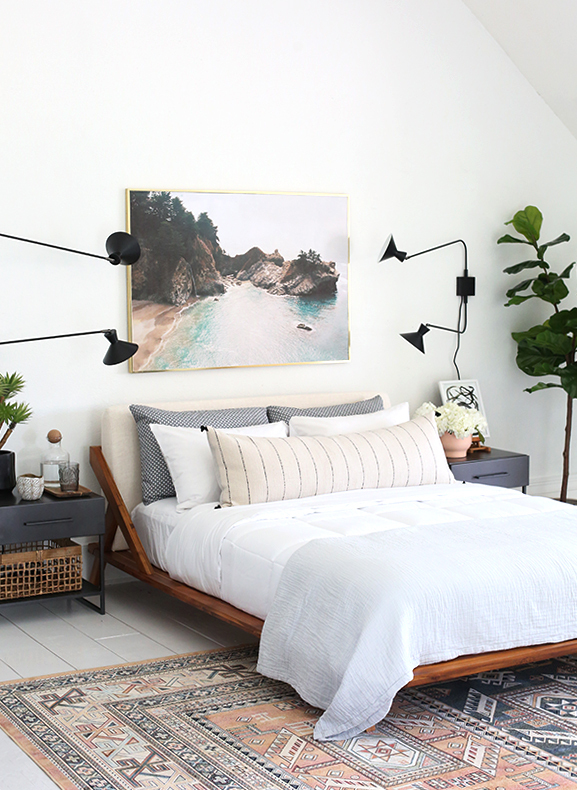 I’m so happy with how this space turned out for our video with this cute Martha Stewart bedding line! In my stories I also gave you a candid update on this DIY plywood planked floors tutorial I did right after we moved to our house, about five years ago (can you believe it’s been that long already?!). In general, I’m still really happy with these floors, but there are a few changes I’d make if I were to do it again, including using a more expensive plywood from a harder wood, like maple or birch. The really inexpensive pine sheets we used have a lot of character now :) with cracks and marks from rolling office chairs (you can see details in my stories!). BUT at $1/foot, I’m still pretty happy with how these floors look and work for us in this above-the-garage suite. This platform bed was probably my very favorite part of the install! It was only $899, which is a killer deal considering you don’t need a box spring or a bedskirt to finish off the look. 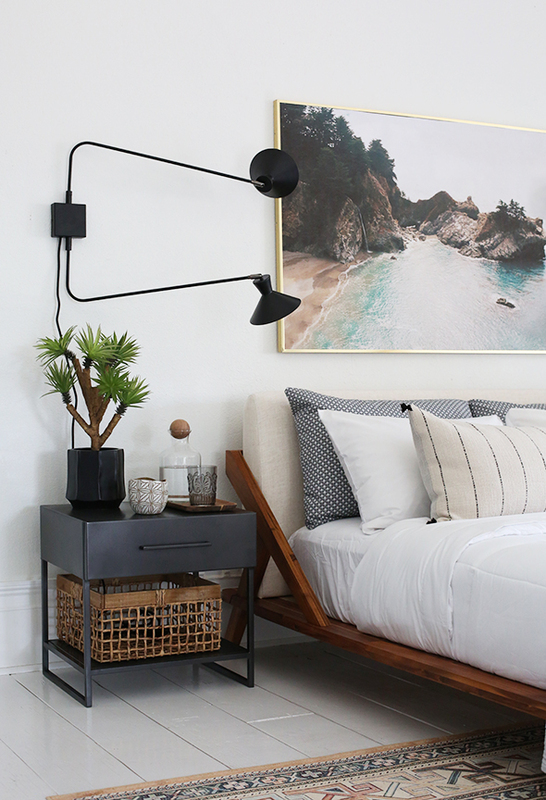 I LOVE the warmth from the wood on the frame, and the softness from the upholstered headboard! It is a GREAT bed. It is lower to the ground because it is a platform bed, but I wouldn’t say it was weirdly small or short. 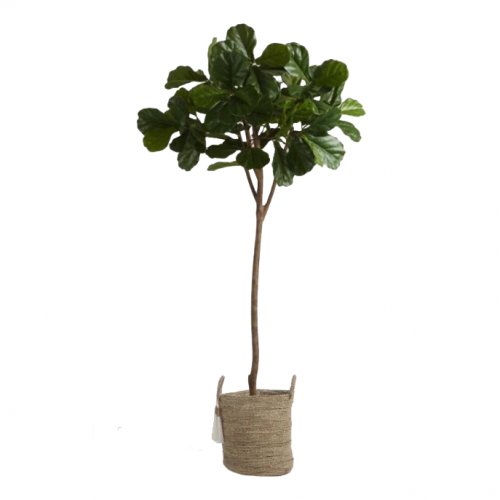 It would be especially great for rooms with lower ceilings, though we have vaulted ceilings in our guest room suite and it didn’t feel too-short in here at all. 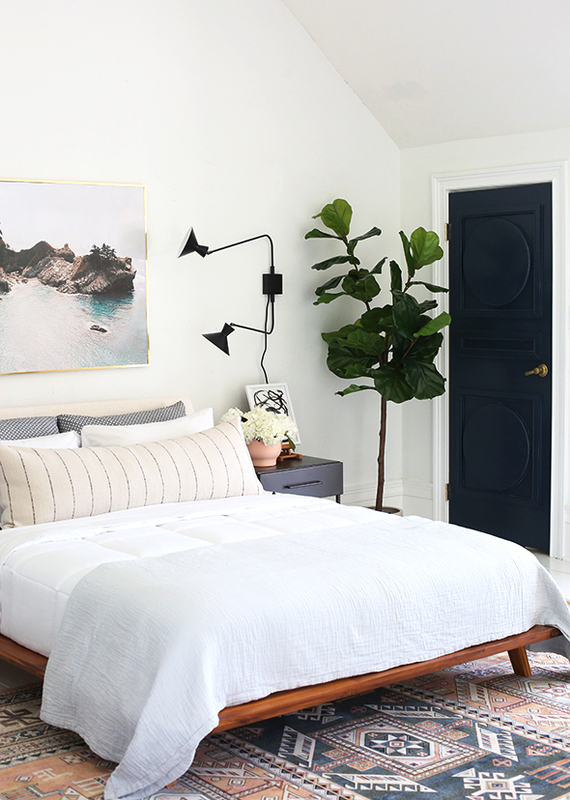 The cute bedding is from Macy’s and that beautiful striped lumbar is from our second Juniper Studio Home pillow collection, which will be launching soon! :) You guys were so amazingly supportive about our last launch! I couldn’t believe we basically sold out in less than an hour! We have been adding a few to the shop here and there lately, but we’ll be sure to announce on the Juniper Studio instagram when the next collection launches. We are focusing just on the lumbar size this time, which is my FAVORITE for beds. I think it makes a bed look done up, but in such a simple and easy way! 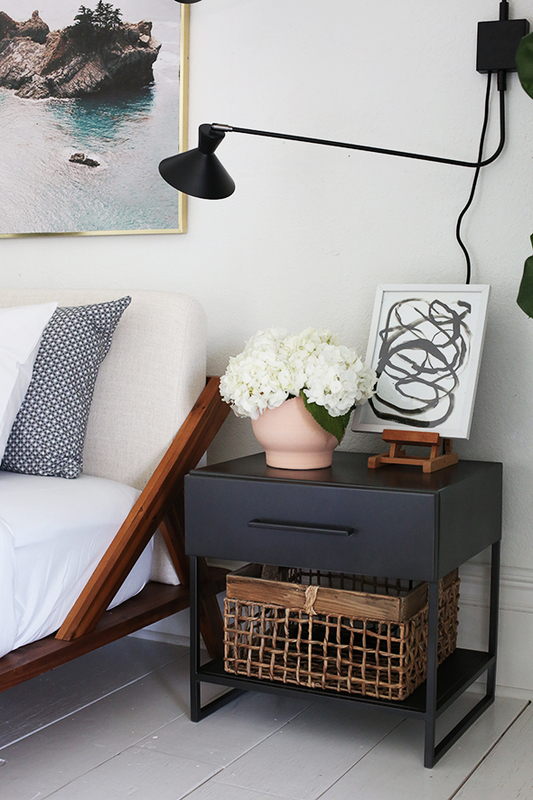 Another surprising find for our new guest bedroom was this SUPER affordable rug! The price has been fluctuating a bit, usually between $260 and $300 for a 7×11′, which is absolutely the PERFECT size for a Queen bed! I love that’s a little longer and skinnier than a standard 8×10. I think it’s ideal for the rug to end about where the nightstands end so there’s plenty of soft rug to see and to step down onto when getting out of bed. 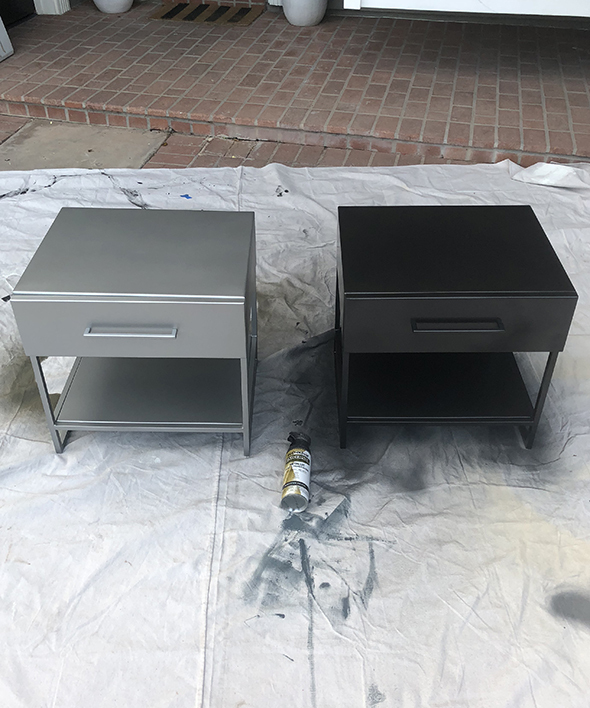 These nightstands were another great find! They were only $199, which I think is still a great price even though I ended up having to paint them. Here’s what the listing photo looked like. Seemed like a nice midtone gray metal color, right? 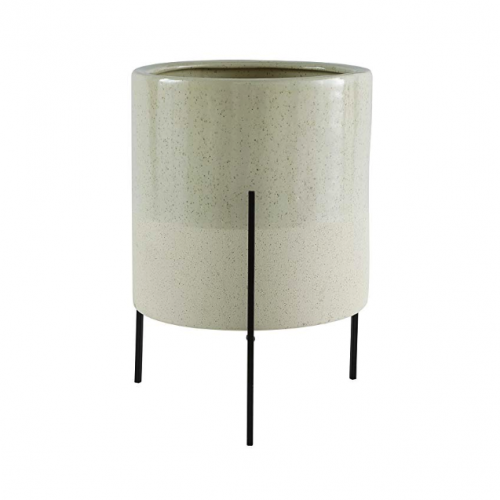 WHY can’t retailers use listing photos that actually reflect the real life color and finish of their products? Like, it seems like this would only save them so much hassle with returns and customer service issues, right? The nightstands did come quickly though and the construction was top notch! 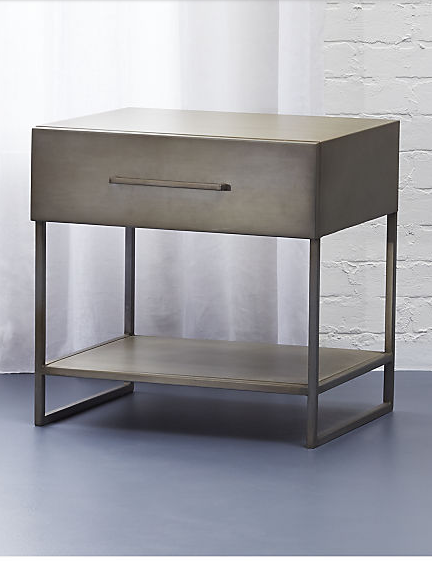 Sturdy, all metal, an integrated drawer pull. I loved everything but the straight up silver finish. 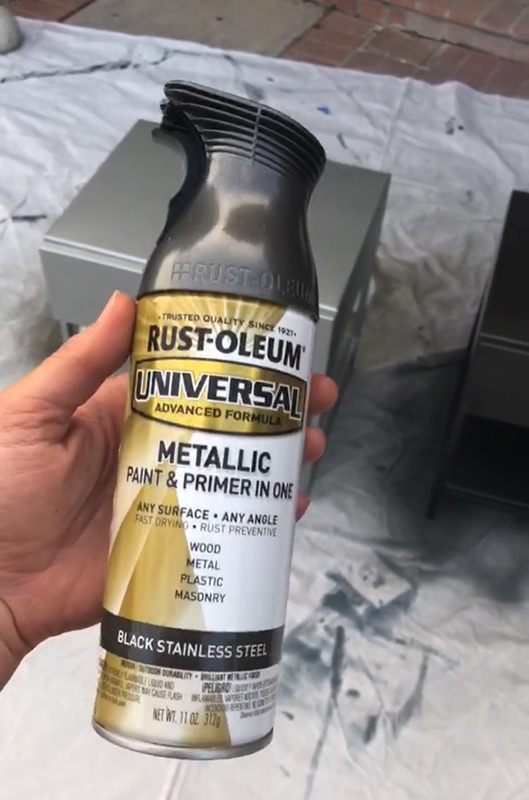 No biggie though – I used Rustoleum’s metallic spray paint in Black Stainless Steel and it was the perfect dark gunmetal color I was hoping for when I placed the order! 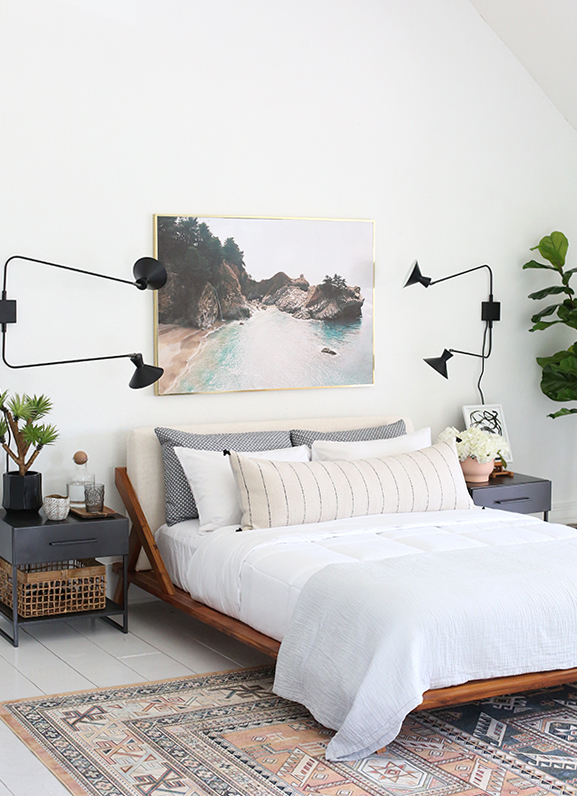 We finished off the space with these two-arm swinging sconces, a faux fiddle leaf tree and a giant print of BIG SUR from photographer Jillian Goulding. It’s one of my favorites in JPS right now! I had the image printed to fit a $3 brass thrift store frame, and I think it looks perfect here. I started the print shop because I wanted to provide art that could be flexible to fit different spaces and frames that you can find affordably. 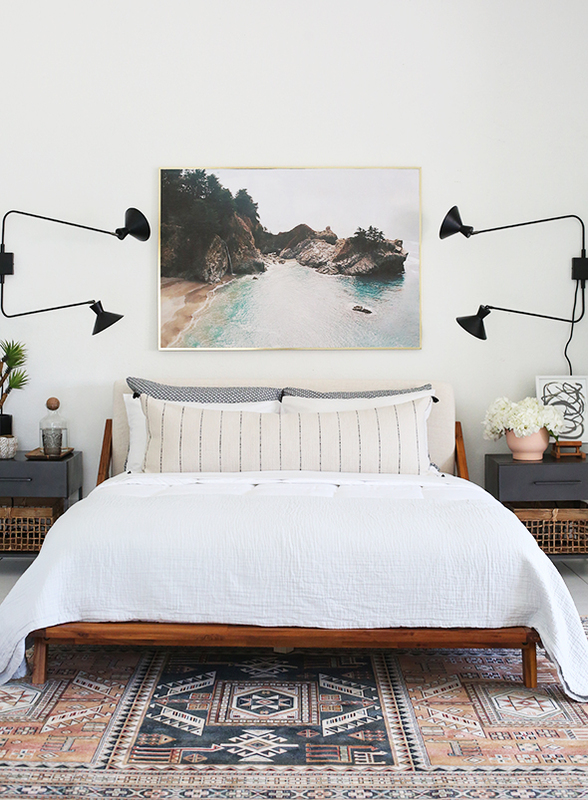 This frame is about 30×40 and everything included would have cost you less than $70! So awesome, right? 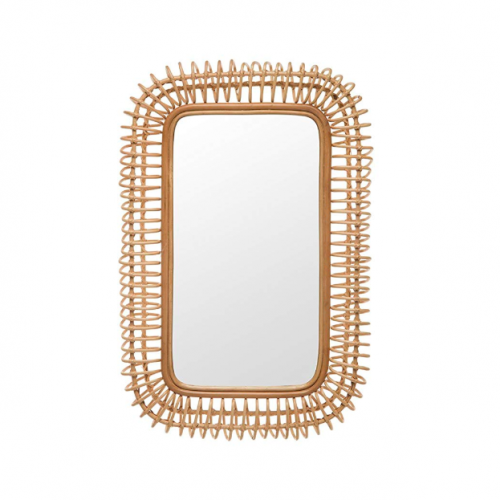 Juniper Studio Home Collection lumbar – coming soon! 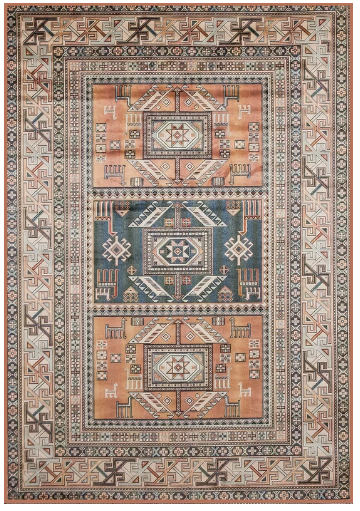 I can’t find the link for the rug. Did you buy it on overstock? 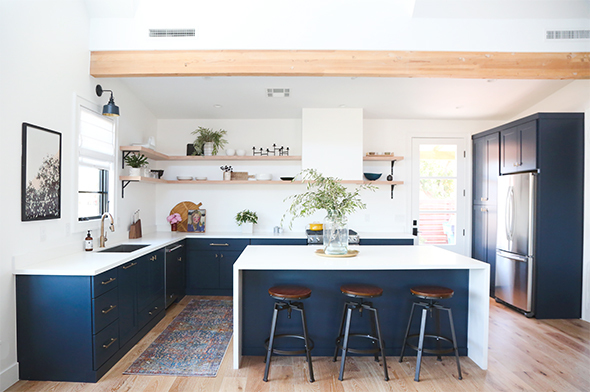 Can you provide a link to the rug? I can’t find it and love it!! We just updated the post and added a link to the rug! Hi! I love this so much I am practically re-creating this for my room right now. I haven’t been able to find the rug anywhere, can you email me where you got it? Thank you! We just added the link for the rug into the post! Really really love it, what a fantastic job! 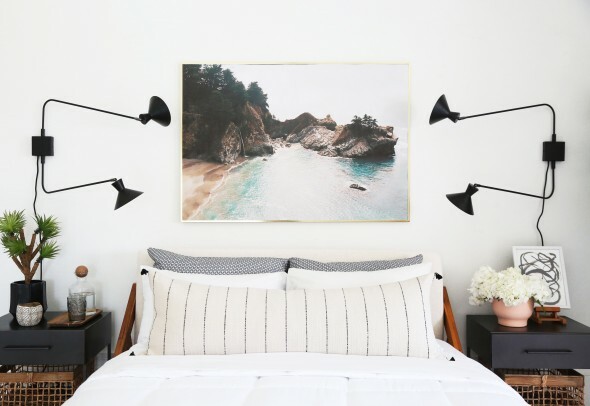 Pingback: Different Lighting Styles That You Should Add to Your Bedroom - Honestly Designed. The whole room is fabulous! I always loved those plywood floors you did!! 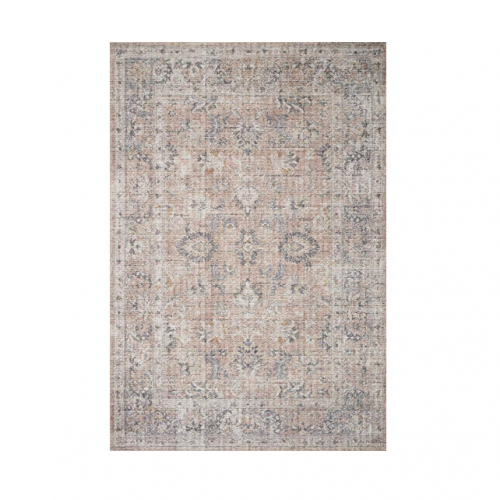 When I click on the rug link- it takes me to a general Overstock rug search and I can’t locate it…do you have the specific name of the rug you used? I love the angles in the design!! 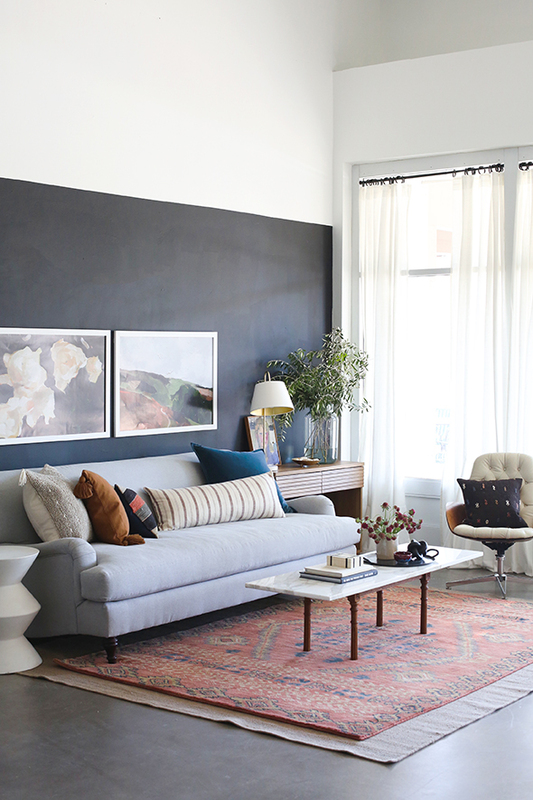 I see the that the rug is from Wayfair but do you have the name of the rug? Oh my gosh, perfect for my needs, thank you or putting together this post.